The Duryea Panorama is a series of photographs providing a birds-eye view of colonial Adelaide. 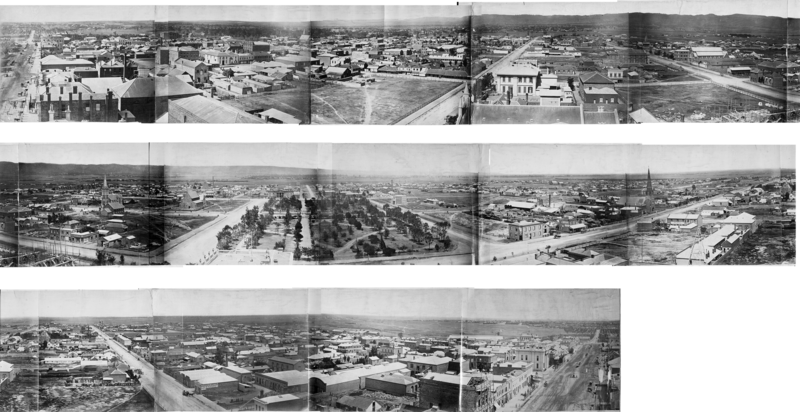 Townsend Duryea took this circular view of the city in late 1865. His pictures, fifteen in all, were taken from the scaffolding around the newly completed tower of the Adelaide Town Hall. He began in the morning, facing north, and worked his way around the tower in an anti-clockwise direction to avoid the sun shining into his camera lens. The panorama was photographed using the wet-plate process, which replaced the daguerreotype. The wet-plate process required a portable darkroom for any outdoor photography because if the plate dried between exposure and development, it was ruined. Duryea must have taken his darkroom with him up the Town Hall tower so that he could develop each picture as soon as it was exposed. Townsend Duryea was born in Long Island, New York in 1823. He was trained as a mining engineer, then took up photography. He left the United States for Melbourne in 1852 and three years later moved to Adelaide where he soon became the colony's leading photographer. When Queen Victoria's son Alfred, Duke of Edinburgh, visited Adelaide in 1867, he chose Duryea to be his official photographer. Duryea's studio was on the corner of Grenfell and King William Streets. In 1875 a spectacular fire destroyed both the studio and Duryea’s entire collection of 50,000 glass plate negatives. He gave up professional photography and moved to the Riverina in NSW, where he farmed until he died in 1888. Kate Walsh, ‘Duryea Panorama’, Adelaidia, History Trust of South Australia, http://adelaidia.sa.gov.au/panoramas/duryea-panorama, accessed 19 April 2019. Thanks for that information Geniene, it's quite probable Duryea moved studio location, but I'll look into it and see what else we can find out. I have a copy of a photo of William Newport and Family taken in that studio, awesome photo too. A distant cousin in NSW couldn't work out who's family it was until she saw a photograph of my great grandmother Mary Anne Newport on my Ancestry.com.au family tree. What I am interested to find out is more about William Newport and his job as a Photolithographer, he was working for the Colony of SA taking images and sketches of areas in the Northern Territory and Far North of South Australia. I guess it is in the DNA this love of photography. I would love to be able to see some of William Newports works, as a photographer myself I would dearly love to re create his photos and images with modern technology. That sounds like a challenge Geniene, we don't appear to have any information on William Newport up yet, but watch this space and we'll see if we can unearth anything.